Water treatment using the UVC method requires no handling of chemicals and it does not need any specialized storage. The UVC treatment of water does not cause change in odor, taste, chemistry and pH of water. This method is a preferred method of water treatment from chemicals and their byproducts. People believe that UV light at the wavelength of 253.7 nm is designed to kill microorganisms as harmful as E.coli, giardia and cryptosporidium that can cause harm. Passing UV rays through water alters the genetic composition of the microorganisms and renders them harmless. It is said that UV-C bulb must be replaced annually to ensure better efficiency. These high-quality lamps last 10,000 working hours after which it is advisable to replace them. 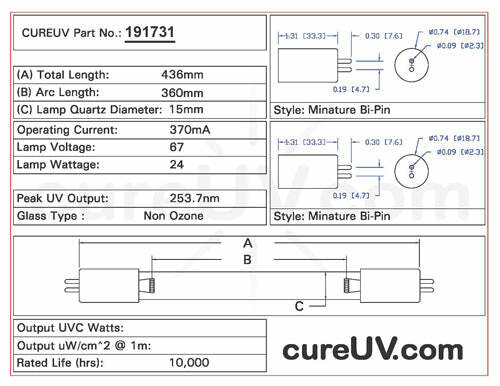 The total length of the UVC light bulb is 17.17 inches and it has a peak output of 253.7 nm that help in destroy microorganisms such as spores, virus, bacteria and other pathogens. Ensure utmost safety when you replace with the Aqua Treatment Service ATS2-436 Replacement UVC Light Bulb.